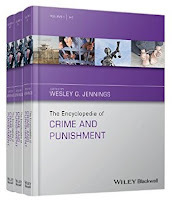 This is a copy of an essay published in The Encyclopedia of Crime and Punishment, edited by Wesley G. Jennings. Malden, MA: Wiley-Blackwell, 2016. Please cite as: Deflem, Mathieu. 2016. "Interpol." Pp. 788-791 in The Encyclopedia of Crime and Punishment, edited by Wesley G. Jennings. Malden, MA: Wiley-Blackwell. The international police organization Interpol brings together police from 190 nations in a joint network for cooperation in matters of international crime. Dating back to 1923, Interpol has steadily expanded its membership and extended its mandate in the area of international police objectives. The events of September 11 and the resulting increased awareness of the problem of international crime and the urgency of its response brought about substantial changes in Interpol’s structure and activities and expanded its field of operation. Interpol is an international organization that coordinates communications and other forms of cooperation among police agencies from nations across the world. At present, Interpol’s membership extends to police institutions from 190 countries, making it the second largest international organization in the world in terms of membership. Interpol is not a supranational police agency with independent investigative powers, an authority that remains solely with police institutions within nations and other confined localities. Interpol’s mandate is also exclusively oriented at criminal offenses at the exclusion of political crimes. The organization dates back to the early 20th century and has been successful in steadily expanding its membership even if its role in the totality of international policing activities is limited. The organization’s mandate includes a wide variety of international crimes, including money laundering, the international rendition of fugitives, and international terrorism. Interpol was originally formed as the International Criminal Police Commission (ICPC) at a conference of police in Vienna, Austria in 1923 (Deflem, 2002). The initiative came after earlier such efforts, specifically the First Congress of International Criminal Police in Monaco in 1914 and the International Police Conference in New York in 1922, had failed. The Monaco Congress of 1914 was dominated by politicians and legal experts, especially from France, who could no longer dictate police on how to execute its functions. The New York Conference of 1922 was not successful because international crime was at that time not a sufficiently realistic concern on the North-American continent. The ICPC was successfully formed in 1923 because the organization could rely on sufficiently autonomous police organizations that shared a common commitment to the fight against international crime, which had seen an upsurge across the European continent after the end of the World War I, especially in the wake of advances in new technologies of transportation and communication with border-crossing capacities. The Commission set up its headquarters in Vienna, at the offices of the Viennese Criminal Police, where various specialized subdivisions on international crime were established and through which international police communications could be routed from and to the various member agencies. The creation of direct police-to-police communications, outside and against the legal system of formal extradition requests, was --and remains-- a central concern of international policing because of the efficiency it was thought to entail in effectively addressing problems of international crime. In the years leading up to World War II, the ICPC expanded its membership, with the Federal Bureau of Investigation formally joining as representatives of the United States in 1938, shortly after the annexation of Austria by Nazi Germany. The international organization became effectively inactive in the move towards and during the war, when the headquarters were eventually moved to Berlin to be brought under the authority of the Nazi regime. There is no reliable evidence to suggest that the Commission was still active in any meaningful sense during the World War II or that its databases were used for purposes related to the international political conditions of the time. Following the end of the Second World War, the organization was revived at an international police meeting in Brussels in 1946 as the International Criminal Police Organization (ICPO) with headquarters in Paris, France (Anderson, 1989; Deflem, 2002). The designation Interpol was chosen for the organization’s telegraphic address and was formally added to its name in 1956. The mission of the organization was affirmed to be exclusively oriented at criminal violations, staying clear of offenses of a political or religious nature. In the 1950s, however, a politically impactful event occurred when a request by the then communist country of Czechoslovakia to Interpol’s headquarters, involving the rendition of fugitives who had been granted asylum in West Germany, was unfavorably looked upon by the Federal Bureau of Investigation (FBI), the organization’s US representative. Under the leadership of Director J. Edgar Hoover, the FBI decided to resign from the organization, after which the Treasury Department took over membership on behalf of the United States, a responsibility that is presently jointly administered with the Justice Department. Despite occasional concerns over Interpol’s political implications and its relative lack of effectiveness, the organization managed to expand its membership on a gradually more global scale and continue to frame its crime-fighting objectives irrespective of political and other divisive conditions among the nations of the world. The collaborative structure of Interpol, bringing together police of different nations rather than setting up a new global investigative force with arrest powers, has been a lasting characteristic of the organization since its founding. The principle of a nationally defined sovereignty of police institutions prevents the formation of such a supranational police force. Any presentation of Interpol, such as it occasionally exists in popular culture, as having its own agents is therefore entirely erroneous. Instead, Interpol membership only serves to establish cooperation among police across the world through a central headquarters. The leadership of the organization consists of a General Assembly, with representatives of each member agency, which meets once a year (Interpol website). The organization also has a President, but the day-to-day operations of the organization are handled by the Secretary General as the head of the organization’s General Secretariat. The current Secretary General is Ronald K. Noble, who formerly worked in the U.S. Treasury Department and is the first American to serve as Interpol’s chief executive officer. Since 1989, the Interpol headquarters have been located in Lyon, a town in the south of France. Until the terrorist attacks of September 11, international communications routed through the Interpol headquarters could be relatively slow as they relied on regular postal mail. But since that fateful day in 2001, several changes have been implemented to bring international police cooperation technologically up to date. Specifically, the Interpol headquarters are now operational 24 hours a day in a Command and Coordination Center. Communications among police are transmitted through an encrypted internet-based Global Communications System I-24/7. The member agencies participating in Interpol are specialized international police offices called National Central Bureaus. In addition to the Lyon headquarters, Interpol also oversees seven regional offices that are dispersed geographically across the globe, besides Europe and North America, in South America, Asia, and Africa. Although Interpol is an independent police organization and is therefore a non-governmental organization, the organization does collaborate with certain international political and legal bodies. Specifically, Interpol has signed formal agreements of cooperation with the United Nations, the European Union, and the International Criminal Court. In recent years, Interpol also has organized several specialized teams that offer operational support, including Criminal Analysis Units, Crisis Support Groups, Disaster Victim Identification Teams, and Incident Response Teams. These specialized units can assist in investigations and data collection in various places around the world as a need arises. The operations of these teams, however, are dependent on requests from local authorities within nations and thus cannot interfere with the principle of national sovereignty and jurisdictional authority. The main method for requesting and distributing information through the Interpol headquarters is a system of variously colored notices (Andriani, 2005). Six different colors of notices represent different kinds of international police requests. The most common types are the red notice to request the arrest of a criminal suspect and the blue notice to request information about a person in connection with a criminal investigation. Most recently, an Interpol-United Nations Special Notice was instituted to communicate police messages in connection with the United Nations sanctions against the Taliban and al-Qaeda. Historically, international policing activities have evolved from efforts to track down the political opponents of autocratic regimes to the fight against criminal offenses across borders (Deflem, 2002). The political origins of international policing specifically lay in the initiatives that were taken in the middle of the 19th century to police feared rebellions by democrats, socialists, and other revolutionaries against the autocratic political regimes of European nations. Gradually, however, police agencies began to take it upon themselves, on the basis of evolving notions of professionalism and expertise, to move away from political offenses towards violations of a distinctly criminal nature. In the late 19th century, such efforts included international police actions against the trafficking in prostitutes, the so-called white slave trade, and related efforts to organize the international rendition of fugitives from justice. During the earlier half of the 20th century, the focus on international crimes was additionally propelled by various technological developments and an increasing trend towards modernization which was thought to also influence an internationalization of crime, specifically by providing new tools of communication and transportation to facilitate crimes across nations. The International Criminal Police Commission was the first multilateral police organization to resolutely focus on these new international crimes, and the contemporary organization Interpol has carried this mandate on into the current age. In its present form, Interpol’s objectives are limited to police cooperation within the context of the mandates of national legal systems on crime and in the spirit of the Universal Declaration of Human Rights. Within this mandate, Interpol focuses on a large number of international crimes, such as drug trafficking, computer and related high-tech crimes, human trafficking, weapons smuggling, intellectual property crimes, money laundering and other financial crimes, environmental crimes, and international terrorism. The expanding operational activities of Interpol reflect the reality that in recent decades the trend towards the globalization of social life has steadily increased, with all due consequences from crime and the resulting need for its policing. Arguably no matter has been more impactful in recent years to bolster Interpol’s activities than the problem of international terrorism (Deflem 2010). Interpol’s counterterrorism attention dates back to the 1970s when various resolutions were passed to address criminal matters associated with terrorism, such as hostage taking and plane high-jackings. The turn towards the international policing of terrorism was most resolutely exemplified by Interpol in 1998 when a Declaration Against Terrorism was enacted. After the events of September 11, Interpol accordingly initiated various relevant actions, including cooperation efforts to track down the perpetrators of the 9/11 terrorist attacks. As the internationalization of crime can only be expected to continue to increase in the years to come, Interpol will likewise continue to be able to expand its mission. The organization’s wide multilateral representation is an important asset, but it also places the organization in confrontation with the more limited but typically preferred efforts that exist at the bilateral level and those that are initiated unilaterally. However, for many smaller national criminal police agencies and those that lack a technologically advanced infrastructure, in particular, the organization may continue to prove its usefulness. Anderson, M. (1989). Policing the world: Interpol and the politics of international police cooperation. Oxford, UK: Clarendon Press. Andriani, R. (2005). The INTERPOL notice system. Crime & Justice International, 21, 18-21. Barnett, M. & Coleman, L. (2005). Designing police: Interpol and the study of change in international organizations. International Studies Quarterly, 49, 593-619. Bresler, F.S. (1992). Interpol. Toronto and New York: Viking. Deflem, M. (2002). Policing world society: Historical foundations of international police cooperation. Oxford; New York: Oxford University Press. Deflem, M. (2006). Global rule of law or global rule of law enforcement? International police cooperation and counter-terrorism. The Annals of the American Academy of Political and Social Science, 603, 240-251. Deflem, M. (2010). The policing of terrorism: Organizational and global perspectives. New York: Routledge. Deflem, M. & Hauptman, S. (2010). Policing international terrorism. In F. Pakes, (Ed. ), Globalisation and the challenge to criminology (pp. 64-78). London: Routledge. Deflem, M. & McDonough, S. (2010). International law enforcement organizations. In S. Kethineni, (Ed. ), Comparative and international policing, justice, and transnational crime (pp. 127-148). Durham, NC: Carolina Academic Press. Wui Ling, C. (2010). Policing Interpol: The commission for the control of Interpol's files and the right to a remedy. International Organizations Law Review, 7, 375-404.